Are these cars empties or are they full? Two CSX locomotives are seen hear leading a massive consist of over 120 carsnear Dunkirk, New York. 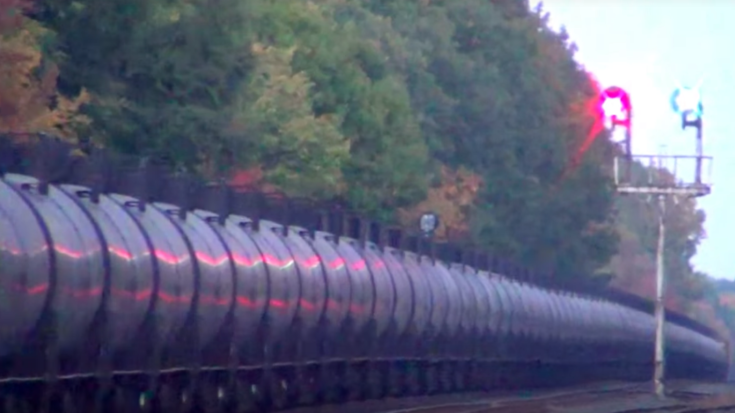 All of this leads us to the question: How much oil does a rail car hold? On average, a 110-unit train at 636 barrels per rail car amounts to around 70,000 barrels of oil total per train. Since oil tank cars are more or less built to Federal Railway Administration standards for GWR (gross weight on the rail) and a load capacity of 286,000 lbs per tank car.. Some tank cars weigh more or less when empty depending on the material used in construction, but cannot go over the 286,000 lb limit when filled. Barrel count also depends on the weight of the crude whether it is heavy or light. Another crucial factor in determining the amount to fill each tank car besides the weight of the oil, is the operating topography the train will encounter during its trip and the rail sidings that will be used for loading and unloading the tank cars. So, how many cars do your think these two locomotives are pulling and are they full or empty? Let us know what you think!